1 The word Baroque comes from a Portuguese word. The word meant "irregularly shaped pearl." Baroque art wasn't round like pearls or gumballs. It did look a little crazy. At first, many people did not like it. 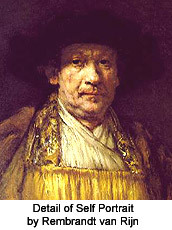 2 Baroque art started in the 1500s. Artists wanted a new style. Before that time, artists imitated the style of the ancient Greeks. Baroque artists didn't want their paintings to look perfect. They wanted to paint real people. They liked the art of ancient Rome because the Romans painted realistically, too. They painted people's warts, wrinkles, and bumpy noses! At first, when people called a painting Baroque, it was an insult. Later, more people liked the new style. 3 Baroque artists used something new. It was the pencil. They liked to be able to carry a pencil in their pocket. They could draw whenever they wanted. Pencils were invented in 1565. A smart person stuck a piece of graphite into a wooden stick.